assets in other crucial technologies, and prohibited from future investments that could allow it to create new monopolies in areas outside its core business. Microsoft must not be allowed to use its hoard of cash to control the future of the computing industry or any other industry. Microsoft’s monopoly does nothing to promote innovation or economic growth, it stifles that innovation and growth until it can figure out how to make it profitable for Microsoft. The reason you don’t have 100Mb Ethernet broadband to your home is that Microsoft hasn’t figured out how to make a profit from it. The reason you don’t have 3rd Generation portable phones is because Microsoft hasn’t figured out how to profit rom them. The reason you don’t have TV on-demand via broadband is that Microsoft hasn’t figured out how to monopolize and profit from it. Microsoft will attempt to monopolize every future technology unless the the Government stops them. 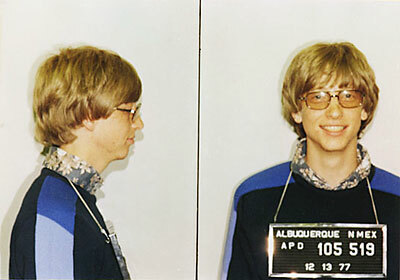 Bill Gates once boasted he was more powerful than the US Government. It is time to teach him a lesson. Some have argued that divestiture is traditionally considered inappropriate for monopolies that were not created through mergers or acquisitions. But this is precisely how Microsoft gained its power, by assimilating smaller corporations and promoting their technologies as “Microsoft innovations.” And this is precisely why Microsoft must be broken up and forced to divest. I once won a contest that sought the best plan to break up Microsoft. I said that initially, I thought that Bill Gates, Steve Ballmer, and all Microsoft employees and properties should be broken down into subatomic particles with high-energy radiation beams. However, on second thought, I figured that Gates and Ballmer would absorb the energy and like the Borg, assimilate that energy and become even more powerful and indestructible. So I decided to consult Federal Regulations and see if they had any guidelines. And I found just what I wanted. I proposed that in accordance wth the regulations of the 1994 Federal Child Safety Protection Act, all Microsoft properties should be broken into the smallest possible pieces but no smaller than 1.75 inches in diameter, so that those pieces would not pose a choking hazard to children. For my proposal, I won the Grand Prize in the contest. The award was a t-shirt with the word “Microsoft” in graphics that looked like the Monopoly board game, with the little Monopoly man with the top hat and cigar poking out through the “o.” I never received my prize. I would have worn it proudly. Next Next post: Who Ate Apple’s Lunch?